This has been a spring of leaks. 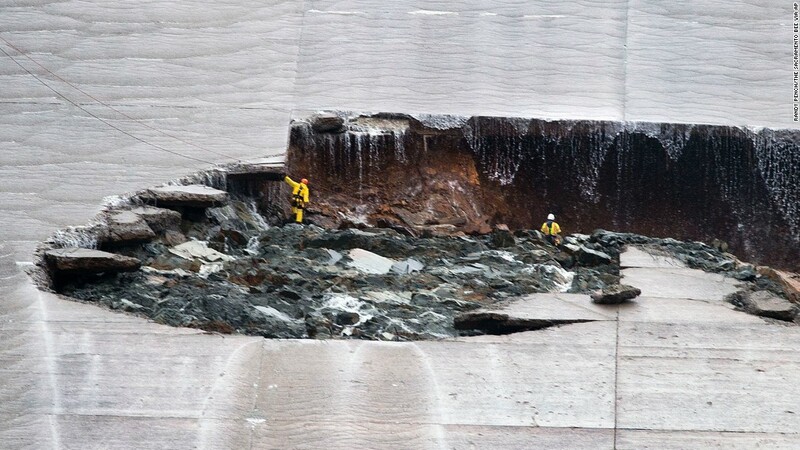 Most of you probably heard about the hole at the Oroville Dam. In my house, we’ve had leaks in both our skylight and our car. Yes, it’s great to be out of the drought, but like other Californians, we’re feeling a bit waterlogged. All this water means that the hydro dams are cranking out lots of electricity. Reservoirs are at high levels, even before the major snow melt, so we’re letting a lot of the water run through the dams and producing cheap hydropower morning, noon and night. If you believe the saying, ducks take to water well. But in the electricity world, the bountiful water is creating problems for the industry’s favorite waterfowl. 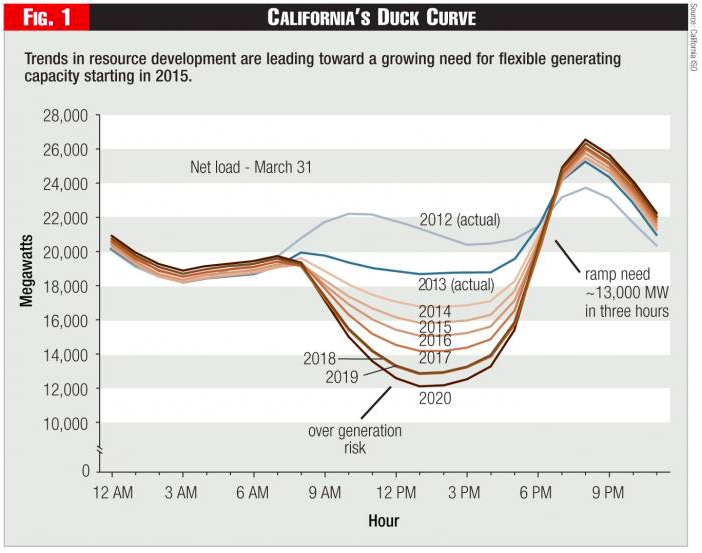 Long-time blog readers have heard several mentions of the “duck curve” – the aptly named graph that depicts energy demand net of wind and solar generation over the course of a day. I’ve reproduced one of the original versions below, which was created circa 2013 and shows projections out to 2020. Much of the focus has been on the duck’s neck – the rapid increase in non-renewable electricity demand as the sun sets on solar plants and people turn on lights. As of last spring, the projections in the duck curve were materializing on schedule, as Meredith’s blog post described. During 2016, however, utility-scale solar PV capacity in the state grew by another 50%. As a result, net load in the middle of the day on a recent Sunday (April 9) bottomed out at 10,000 MW (see the green line in the graph below), instead of the 14,000 MW projected for 2017 in the forecast duck (the dark orange line labeled “2017” in the graph above). All the solar and hydropower have led to a new phenomenon – negative prices in the middle of the day. 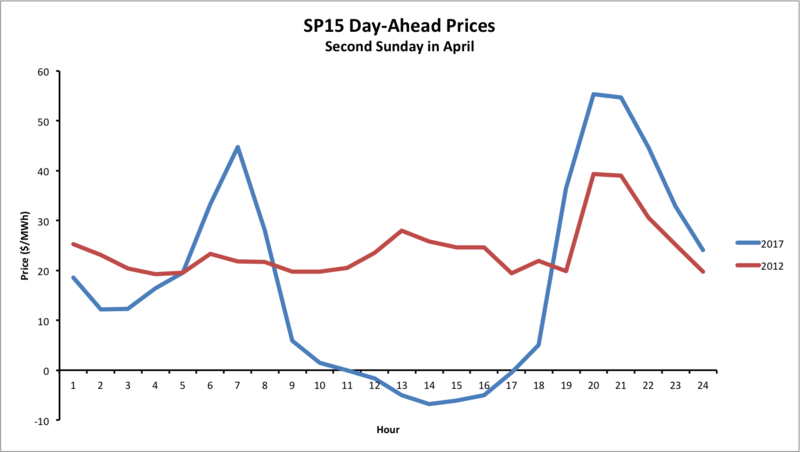 The blue line in the graph below depicts day-ahead prices for Sunday, April 9 in Southern California. For comparison purposes, the red line depicts day-ahead prices at the same location on the second Sunday in April 2012. Looks like another version of the duck, albeit drawn by a preschooler, and this time with price on the vertical axis. Note that I picked April 9 as an example. Through yesterday, there were 19 days during March and April 2017 with negative midday prices in the day-ahead market in the South. They’re certainly more common on weekends, when people take breaks but the sun doesn’t. But, 7 of those 19 days were weekdays. Also, I’m focusing on the South, as that’s where most of the grid-scale solar is located. For the three days I checked, though, prices were also negative in the North. Let’s first wrap our heads around what it means to have a negative price. On these days, if you were in southern California, the ISO was willing to pay you to consume electricity. Nearly all retail customers are on fixed tariffs that do not vary with wholesale prices, so they were still paying positive prices for electricity. 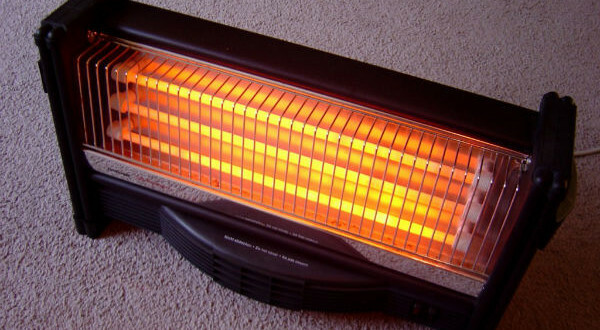 But, if you were exposed to wholesale prices, you would have made more money the more electricity you consumed – just plug in your least efficient electric space heater and watch the dollars role in. You may wonder why an electricity generator would be selling into the market when prices are negative. If you’re the owner of a large solar plant in the desert, for example, can’t you just turn off your connection to the grid, instead of having to pay to feed electricity into the market? Similarly, why would a gas or nuclear plant use costly fuel to sell into a market with negative prices? The production tax credit. Some renewables owners (mainly wind) are eligible for a production tax credit, which essentially pays them, in the form of a tax credit, for every MWh they produce. So, not producing means that they have to forego this credit. In theory, producers will pay to sell into the wholesale market as long as they’re paying less than the tax credit. The Renewable Portfolio Standard. Under California’s Renewable Portfolio Standard (RPS), utilities are on the hook to provide 33% of their electricity from renewable sources by 2020 and 50% by 2030. The utilities sign contacts with renewable providers and, while terms likely vary, the utilities want to meet their RPS targets. In the extreme, the utilities are on the hook to pay a penalty (which was $50/MWh early on) if they don’t. So, they generally want to encourage the renewable providers to produce. For example, under a very simple power purchase agreement, the utility would pay the renewable provider a pre-specified price per MWh irrespective of the wholesale market price, leaving them no incentive to shut down when prices are negative. Operating constraints. For some power plants, varying the output level entails high costs, particularly starting and stopping the plant. I think of those as analogous to the extra fuel, plus wear and tear, planes expend taking off. So, if it costs a lot to restart a nuclear plant, for example, you’re willing to pay not to have to turn it off to avoid incurring those costs. In the graph below, we can see that the state’s lone nuclear plant, and even some thermal (which is essentially analogous to fossil-fuel) plants were still operating on April 9 when the prices were negative. The cost of turning plants on is also reflected in the real-time prices from April 9. Just like the day-ahead prices, they were negative in the middle of the day. But, they really spiked during the morning and evening ramps (to $1000/MWh!) when plants needed to turn on to meet the additional demand. What do the negative prices tell us? At a fundamental level, they tell us that we have too much of a good and suppliers need to pay people to take it off their hands. Right now, California has too much renewable electricity. Emphasizing this point, a recent briefing from the California Independent System Operator noted that renewable “curtailments” were at record levels in March 2017, amounting to over 80 GWh, which is more than a typical day’s worth of solar production that month. Is there anything to do about the negative prices? Negative prices certainly highlight the value of storage, where the basic idea is to buy low and sell high. Buying when prices are negative is especially lucrative. Standalone storage is still expensive, but the costs are rapidly declining. Increased electrification of transportation may provide one type of storage or at least flexible demand. Another solution is to expose more retail consumers to wholesale prices, or find other ways to encourage customers to respond to real-time prices. Economists have bemoaned the disconnect between wholesale and retail pricing for years—maybe the prospect of being paid to consume electricity will help more people see the value of this?!? In addition, generators that historically operated through the belly of the duck, including nuclear, combined heating and power, and conventional natural gas plants might be encouraged to reduce their output. For example, while it may not be practical to cycle nuclear generation on a day-to-day basis, maybe refueling outages could be scheduled for the spring, when excess supply problems are generally the worst. 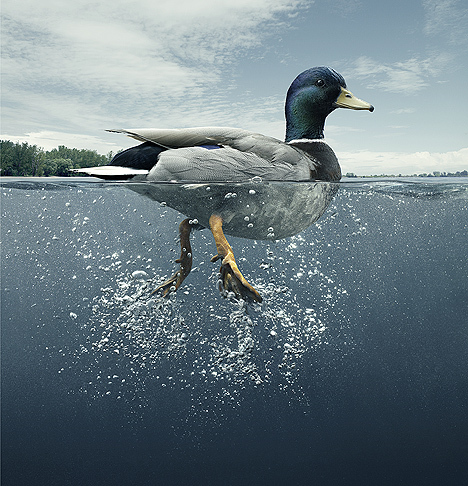 To round out the post with another duck-ism, the duck may look calm, but we need to pay attention to what’s going on below the water line – the zero price line in this case. The duck is paddling furiously, as operating an electricity system with a lot of renewables isn’t easy. Next Next post: Save the California Waiver! California has waivers for at least two NERC reliability standards, so the fact that there were no NERC violations may not mean anything. Moreover, there’s an enormous difference between 50% renewable production on a daily basis and 50% renewable production on an annual basis in terms of cost, resource requirements and the ability to provide reliable electricity. In other words, it’s a bit early to celebrate. Finally, there’s been a lot written about how wind and solar are competitive with fossil-fired plants, but it takes some digging to see that the comparison is one of apples to cow turds. The busbar cost of solar, for example, doesn’t include the impact of production curtailments or the cost of resources that have to be available during bad weather or the cost of storage to carry the grid through periods when there is no sun (meaning at night). Customers with roughly statewide average electricity consumption who might think about “cutting the cord” by installing a combination of rooftop solar and Tesla Powerwalls are looking at an investment in the range of $40k or more before converting their domestic heating and hot water systems to all-electric. Their “busbar cost” of 30 cents per kWh for a less reliable power supply is another way of looking at the cost of an all renewable grid. The solar cells might last for 20-30 years until they are replaced. (The old solar cells must be discarded as hazardous, toxic waste.) Tesla PowerWalls have a remarkably short lifetime before they must be replaced. (Ten years is a nominal value.) As CGNP’s CPUC testimony documents, over 71% of DCPP’s basis (of about $8 billion) is comprised of conservatively-designed components whose expected lifetime is a minimum of 60 years. Why do our electricity prices keep going up and are close to twice the national average! My brother-in-law in Chicago sent me his bill – 11.5 cents/kWh. Here, I am paying 22-23 cents! According to this article (http://www.npr.org/sections/money/2011/10/27/141766341/the-price-of-electricity-in-your-state) the US average is $0.12 and the CA average is $0.15. Just a bit above the US average and nowhere near double. And that doesn’t factor in the health and enviormental costs of those dependant on coal or the volitility of the cost of natural gas. Plus, of course, the impact to our climate. gives a breakdown of how high the marginal costs are. Your brother-in-law can thank his local nuclear plants. Daniel – thank you for the map of nuclear plants. The Chicago area is loaded! I knew they had a lot; it looks like close to about 15,000 Megawatts and probably most are now fully amortized – paid for. Can this supply nearly 10 million households in Illinois, Wisconsin. Michigan, Indiana, etc., as I estimate!? Nuclear fuel alone, usually enriched Uranium in US, is pretty cheap. Natural U, 99.3% U238 and 0.71% the fissionable U235, costs about $65 per kg which has the energy of 20 tons of coal costing about $1000 delivered. This is not the whole cost story as the natural U has to be enriched to about 3% U235 for the water-moderated reactors we have. Also, plant operation is more expensive, and the U fission products absorb thermal neutrons and eventually reduce efficiency such that the fuel rods have to be replaced every year or two, and these radioactive rods stored safely! They also add the costs of the eventual shutdown and clean-up, [storage of radioactive pieces in some remote Nevada site! ], etc., to the electricity charges. Indeed. Here in Arizona, right across the Colorado river from you, we have 13 cent power, flat rated, with no ups for higher consumption. Thanks for this essay. As the recent 21 April 2017 San Francisco power failure illustrated, electricity powers the California economy. Power needs to be available 24/7, 365 days a year. High-quality dispatchable power sources such as Diablo Canyon Power Plant (DCPP) provide high capacity factor (96% in 2016) emission-free power at a reasonable price. Perhaps California energy policies could require thermal power generation sources be curtailed during these low-demand periods. However, in most parts of the state, the surprising fact would be that emissions would not have significant declines since the thermal generation would be operated in “back down” mode. It must be ready to come back online almost instantly if a cloud passes over a large solar facility or the wind abruptly stops blowing fast enough. In other words, it may be false economy – – and more harmful to the environment to have a California loading order that fails to take into account the QUALITY of the generator’s power in addition to its emission-free nature. These are some of the issues that Californians for Green Nuclear Power, Inc (CGNP). is raising this week (during the CPUC hearings regarding DCPP’s future) as an intervenor on behalf of California ratepayers and the environment. I’d be honored to be asked to summarize CGNP’s testimony for Energy at Haas readers. Diablo Canyon is not dispatachable, it’s base-load. It does nothing to solve the duck-curve problem, since we can’t turn it down mid-day when solar is producing a lot of power. Dear Andy: Actually, DCPP’s pair of Westinghouse four-loop PWRs are capable of ramping output on a routine basis. They were designed to include that capability, which is occasionally utilized by DCPP’s owner. CGNP’s CPUC testimony includes more detailed information. CGNP also notes a Idaho National Laboratory study that was published late in 2016 that calculates that the 2015 cost of DCPP was about $27.10 per MWh (or 2.71 cents/kWh.) In contrast, PG&E has a long-term contract for power from the Ivanpah Solar Concentrating Plant for 20 cents/kWh. Thus, any PG&E curtailment should also factor in the unit cost of the non-emitting energy source being curtailed as an economic decision, not a power engineering decision. Nothing I wrote suggests that I think we should shut down any nuclear power plant. I’m actually against shutting down operating nuclear plants (http://www.asilberlining.com/2017/04/12/making-the-case-for-nuclear-energy-in-the-21st-century-an-evening-of-pro-nuclear-discussions/) and I’m open to building new ones. I’m might be incorrect on my catagorization of nuclear as non-dispactchable. How much efficiency do you lose when you ramp down a nuclear plant? If you’re consuming just as much fuel, then it’s not really any more dispatchable than feathering the blades on a wind-turbine makes it dispatchable. If you are talking about gentle ramps of 3% full power/minute then yes nuclear is dispatchable – France has been doing this for decades. But you save little money by dispatching nuclear. What should be done is to put nuclear and hydro into the the same carbon free category as wind+solar. We should stop treating wind+solar as something sacred – every power generation form has its downsides. If CO2 emissions are the concern then all generators that are essentially emissions free should qualify for the “Renewables Portfolio Standard” and I think we should drop production subsidies. Andy: Please recall that a nuclear power plant contains the energy source within the reactor. The control room controls how much reactivity occurs per unit of time. Un-fissioned nuclei that result from ramping down the reactor are still available for future use. @drgenenelson : Refueling shut downs are planned many months in advance, or even already planned when the fuel is loaded. There’s no economic gains from shifting them a few days, especially in the US where they are planned to occur in low demand season. If you plan from start that you will run the plants only at 66% power in average, maybe you can shift the refueling several month and find a different optimisation, but that’s hard. Basically you can’t really say you save anything economically when you don’t run at full power. Your analysis overlooks the 15 miles of absolutely fabulous California coastline that’s essentially become Diablo’s exclusion zone. Spacial comparisons are tedious. You can put wind mills on a farm and/or on otherwise unproductive land. Solar farms are generally placed out in the boonies. 1,000,000 acres of solar * the Boonie Factor of Ghost Town X = Who cares? We’ve got a 100 million acres of corn, 50 million acres of corn and 50 million acres of roads/parking lots. We don’t care about space – we care about price and utility. California has hundreds of MW of hydro on standby frequency control at all times. Thermal plants are kept in reserves to cover system contingencies – not forecasting errors. If we need to curtail output due to over generation the renewables should be the resources that are shut down – not the less flexible resources like Diablo Canyon. Lets stop treating renewable energy as a sacred cow. It is well known in the industry that the cycling a nuclear plant is a no-no. To some extent it can be done but the cost is exorbitant. That’s why nuclear plants offer into the market at a zero price. France’s EDF does it every day. The German units also did quite much when they were a more significant part of the mix. One final comment. The article refers to renewable curtailments in March exceeding one day’s average solar generation in that month. The data is correct, but it would perhaps be more enlightening to compare renewable curtailment to renewable generation, or solar curtailment to solar generation. It’s also useful to distinguish system curtailment form local curtailment, as the CAISO does. Local curtailment is, by definition, based on local constraints, such as locally low prices caused transmission-constrained areas with lots of renewable generation (the Imperial Valley comes to mind). The long-run solution to local curtailment can be more transmission, so the local area will look more like the system, without any need to change either generation or demand. Ignoring local curtailments, for 2017 to date (through 4/23), system solar curtailment has reduced CAISO solar generation by 2.3 percent from what it would otherwise have been. But if you split that between the 26 days when the CAISO reached 50% renewables at some point during the day, and the 87 days when it didn’t, there’s a big divergence: days when renewables reached 50% had solar generation curtailed 5.3% by system curtailments, while the curtailment was only 1.0 percent for the other days. That level of curtailment is lower than the curtailment experienced by thermal power plants due to forced outages, let alone economics. The graphics are interactive; you can toggle the data sets by clicking on the dots in the legend. Almost all curtailment is economic, split between system and local. A lot is from utility-scale solar, mostly due to contractual reasons. That’s an interesting perspective to compare overgen curtailments to forced outages in conventional plants. In a way, it’s a mirror of the other problem. We don’t see folks complaining about lost generation from forced outages–we just plan for the probability that they will occur. The article is correct that the belly of the duck is lower than forecasted a few years ago, that negative prices are more common, and (probably, though I haven’t seem actual data) that the CAISO’s job is getting harder. But California’s electricity policy is not about making life easy for the CAISO, it’s about getting to 50% renewable generation by 2030 on an annual basis. That means that by 2030 the average hour will need to have 50% renewable generation. So it’s encouraging to see that 50% renewable generation is already being achieved in 2017 without grid failure (or even reported NERC violations). Yesterday the CAISO had 10 hours with an hourly renewable percentage over 50%, and 5 hours over 60%, and peaked at 63.8% in HE15 (OASIS for loads, Daily Renewable Watch for generation). From March 23 to April 23, the CAISO had 108 hours with over 50% renewables. The future is already here, albeit unevenly distributed (apologies to William Gibson). The goal is 50% renewables over a year, not each hour, minus efficiency gains, wind in the Pacific Nortwest (where wind blows in the spring, competing with hydro at a low demand time of year), etc. Since California has relatively little wind during the winter, when demand is higher than in the spring and fall, those two low demand seasons will need more than 50% renewables, even with that extra help, so mid-day will continue to have too much solar when demand is low. Meanwhile, other sources of electricity don’t have the subsidies, so the market will need to find ways to pay them more. Yesterday, 4/23/17, the CAISO hourly minimum demand (measured using hourly load per OASIS and hourly wind and solar per Daily Renewables Watch) fell below 10,000 Mw for 5 hours and bottomed out at 9456 Mw in HE14. During that hour it fell as low as 9223 Mw at 1340 (measured by load, solar, and wind data in the CAISO’s Today’s Outlook page), and perhaps a little lower at 1320 (Today’s Outlook data is not apparently not archived, so unless one writes it down in real time, one can only squint at a graph). The record low net demand on 4/23 was certainly due to near-record wind, high solar, and low load on an April Sunday. But the fact that one Diablo Canyon unit shut for refueling the day before helped, because it meant less solar curtailment would happen, and thus net demand could go lower. We’ve never considered it to be a crisis when we do not operate our oil, natural gas, or coal plants to the limit of their availability. We call that “economic dispatch” and we consider it to be normal. So why is it a big deal if a few hours a day, for a few weeks of the year, in a really wet hydro year (California at 180% of average; the Pacific Northwest at 130% of average) that we have a surplus of renewable energy? Seems more like having a little bit of frosting left in the bowl after making the cake. Any 4-year-old knows what to do in that situation: find a secondary use for the surplus. The graphic above, however, shows that the nuclear units at Diablo Canyon were running during the negative-price hours. My guess is that some of the imports that continued through the negative-price hours were coming from Palo Verde. Bonneville routinely puts the Columbia Generating Station into an economic dispatch mode during the Spring. It’s not clear if there is a reason that the owners of Diablo and Palo could not do the same. Indeed there are some real constraints. Hydro projects this year are being run to meet their flood control rule curves, meaning they MUST release enough water (generally through the turbines) to ensure that melting snow above has reservoir space. Some hydro units must generate to avoid nitrogen supersaturation, which gives juvenile salmonids gas bubble disease. And, indeed, the RPS and PTC provide an incentive to operate fully dispatchable renewables (it’s not hard to feather the props of a wind turbine) at negative market prices; that’s a human-made (and human-solvable) challenge. But it comes down to a few hours a day, a few days a year, because solar production increased faster than system flexibility did. The solution is to step up the system flexibility, not slow down the clean energy deployment. There are a number of loads we could shift into this period. First, California has a very low saturation of electric water heating. By replacing gas water heaters with electric heat pump water heaters, we could be heating water at mid-day, for use all evening and overnight. We know we must stop using natural gas for space and water heating to achieve an 80% reduction in CO2 emissions by 2050, so why wait until 2049? Second, we could be using ice-storage air-conditioners to make “cool” at 10 in the morning, and then use it condition buildings at 6 in the evening. We could modify commercial electric rates to eliminate the demand charges during the middle of the day, and move those costs into the evening TOU energy rates. And we could adopt TOU rates for all classes with the highest rates in the evening, and lowest in the middle of the day. Why do California rates mostly still include 12 – 6 PM as the “on-peak” or “mid-peak” period? Mired in the past. Even the SCE “super off peak” irrigation pumping rate Schedule PA-3 SOP sets the “on-peak” highest price during mid-day year-round and defines “super off-peak” to mean midnight to 6 AM. FOLKS: we have a NEW “super off peak” period during the Spring months. I would add to your list of responses demand response on Level 2 EV charging stations. Great response Jim Lazar… getting the price signals right (it’s crazy that TOU rates incentivize on-peak consumption! Hello?! ) will go a long way towards letting the market figure this out. Water heating, chilling, EV charging, and dozens of other solutions will happily eat up the leftover frosting in this bowl. One discovery was that contracts are a major contributor to curtailment. So you might add “contract reform” to your list of duck-flying lessons. Jim, on midday superpeak rates, both PG&E (in its 2017 GRC Phase II) and SCE (in its 2016 RDW) are proposing midday superpeak rates during the winter and/or spring season. These are not yet adopted by the CPUC, but that’s a procedural issue. It sounds like more water is being run through the hydro turbines than is really needed for denitrification. So, pending those flexible-demand schemes you are proposing, more flexibility on the supply-side would be welfare-enhancing as well. Perhaps the RPS incentives can be fine-tuned so that production of a negative value is not paid a positive price. Better yet, tailor the instruments to the objectives (internalization of pollution and knowledge externalities). Gas unit have a minimum level of production they need to respect in order to comply with pollution regulation. Below that level, they emit too much pollution compared to their output to be compliant. Also if you shut them down completely, you will need to burn more gas to restart them, and you’re not certain you’ll be able to restart them. They’re not so reliable globally, and specifically have a very significant percentage of restart failure. In one of the recent electricity crisis in Australia, one of the peakers that have asked to provide emergency power had all 4 burners fail at restart. So it’s difficult to get the treshold low, maybe some older gas units have been replaced by more recent ones that have a lower minimum treshold or maybe they’re operating with lower security margins now, which has it’s risk. Anyway it won’t get much lower than where it’s now. I think your reference for the statement above might be a bit outdated for the residential market. The E-7 residential rate schedule associated with a “ 12-6 on peak time” was closed to new PG&E customers back in 2007 or so. The PG&E’s E-7 TOU rate schedule was canceled/eliminated for all residential customers back around Feb of 2016. Back in 2006, or so, an alternative TOU rate schedule (E-6 TOU) was made available to PG&E residential customers. Peak time was moved out to 1 to 7 pm for the summer months only. A new Part Peak price per kWh was instituted for the hours between 10 am to 1 pm (M-S) and for the hours from 7 pm to 9 pm M-F for this rate schedule in the summer months. During winter time the part peak time period is 5-8 m-f off all other times were off peak. E-6 was closed to new customers about a year ago. My in-laws took a new TOU rate that has peak times at 5 to 8pm. I was an e-7 customer and opted to take an E-6 rate for a few years as we have had PV for 11 years. Energy Institute Blog Is the Duck Sinking?